ATHENS, Ga. (AP) — Georgia’s offense is peaking just in time for its ultimate stress test against Alabama. As usual, No. 1 Alabama (12-0, No. 1 CFP) has relied on strong defense. It is a rematch of last season’s national championship game , a 26-23 overtime win for the Crimson Tide. 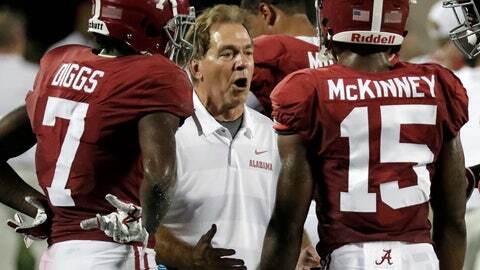 Alabama boasts its customary top-six national rankings in scoring defense and total defense. The defense has been overshadowed by quarterback Tua Tagovailoa’s big year, capped by his five touchdown passes in last week’s 52-21 win over Auburn . Fromm said he sees some of the same players back from the Alabama defense he faced at Mercedes-Benz Stadium in last season’s national championship game. Since Georgia coach Kirby Smart is the former longtime Alabama defensive coordinator, Fromm said the Crimson Tide’s defense also reminds him of the Georgia unit he faces in practice. Incredibly, two different Georgia backs are within reach of 1,000 yards one year later. D’Andre Swift has topped 100 yards in four of the last five games to lead the Bulldogs with 962 yards rushing. Elijah Holyfield has 896 yards. The success of the running game remains the foundation of Georgia’s offensive success. Smart said he expected more big numbers on the ground even after losing Chubb and Michel to the NFL.